I think it's a big, and common, social media mistake that companies very often make thinking "if we have a social media outlet, fans will come", which is sort of true, they'll come, but if there's nothing compelling, they'll just leave. A few weeks ago Runner's World threw out a bone on Twitter, auctioning off some of Bart Yasso's racing medals for charity. Wtf? Seriously? Own one of Bart Yasso's medals? I jumped in on ebay and bought one. 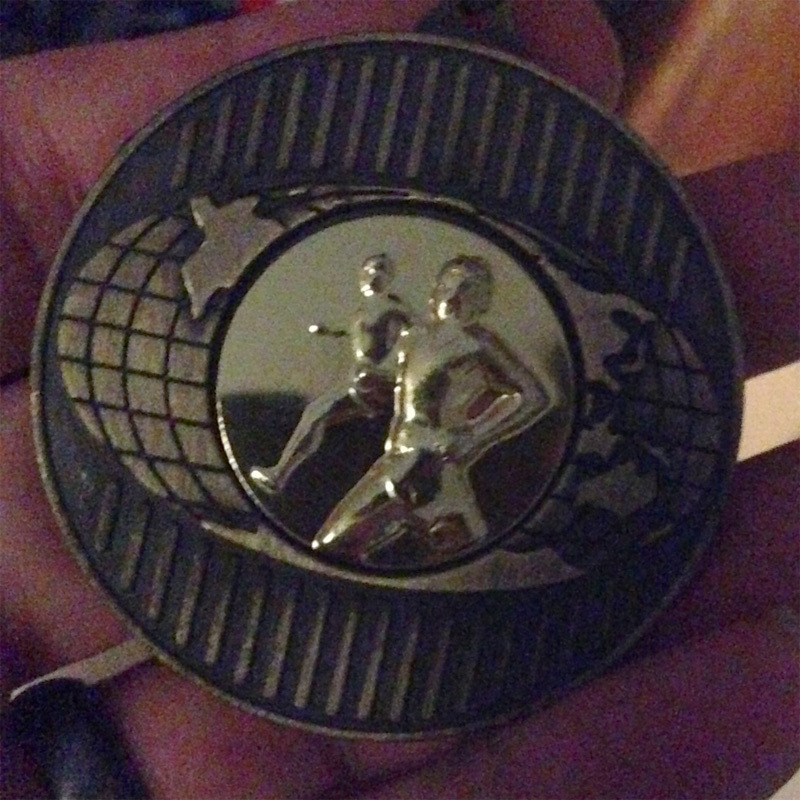 I figured it was wrong to buy a medal from a race that I couldn't run, so I picked up one from a half marathon and decided that I'd run that distance to "earn it" -- in which way everybody wins, the charity wins the money, Bart clears up some space on his mantle, and, well, I get to run 13 miles. I happened to be in DC that week, photographing Senators, but there was a delightful three hour void in my schedule where I was able to run around the Mall, North up to the White House, over into Virginia, get lost trying to find the Marine Corps Memorial, loop back around the Jefferson Memorial, then zig-zag across the mall, loop around the Capitol, top off 13.1 miles and see an awful lot of the most beautiful places of Washington. 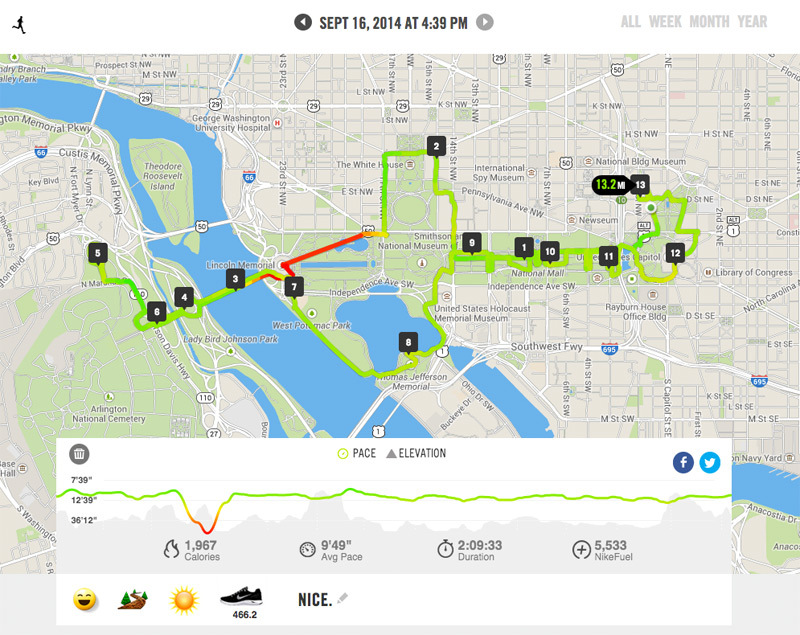 My Bart Yasso Medal Half Marathon in DC. One thing I've heard a lot of people say is that running clears their heads and lets them think about things -- and that seems to make sense. It's hard to get distracted when everything hurts, and there's an inexplicable joy in the pain and everything starts to turn into a dull buzz and at some point your brain detaches and it's able to function above the cloud of how awful it is to be running -- because it's not really fun -- it's as unpleasant as you think physical exercise is, but ... but there's something glorious in it too, which I can't exactly explain. 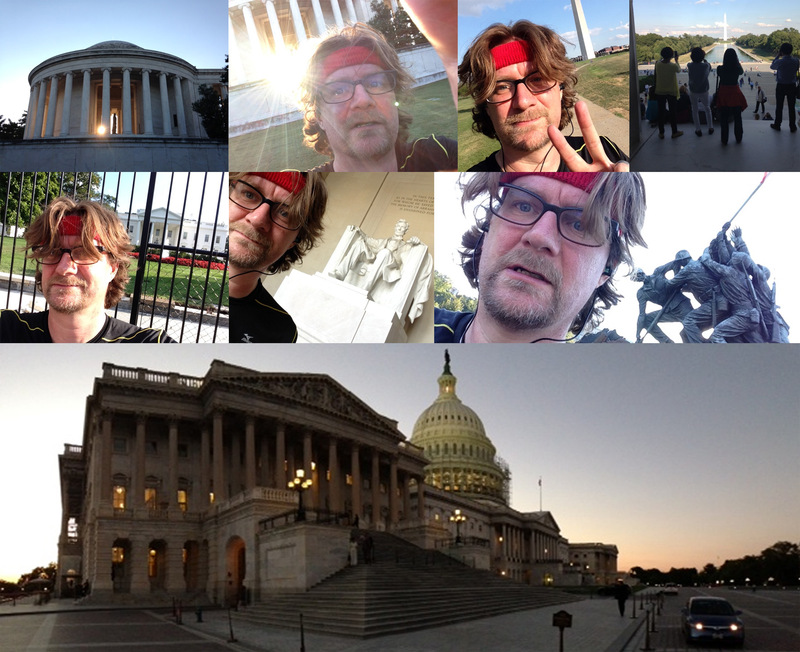 So I ran and I saw lots of presidents. And I was pretty much done by mile 9, but you don't quit at mile 9, so you gut it out, and somewhere along the way is this glorious realization that you can gut out four miles and you realize that the thing that exercise has taught you is that it's ok to be uncomfortable, and it's ok to be uncomfortable for a long time because there's a reward at the end -- even if the reward is just "Ah, now I've stopped doing this terrible thing" -- which kind of makes no freaking sense when you look at it written out, but it's true. I spent a lot of time at the Marine Corps memorial, but that's fine. Congratulations! That's an awesome run and a great reward you were able to give yourself for finishing it. I can't run a half marathon yet, but I hope to some day. At this point I'm at the "building up to being able to run a mile nonstop" point, but I figure I'll get there eventually. When I started I couldn't run an entire block, seriously, not a block. I figure I can't start anywhere other than where I am, and if I keep trying, I can only get better, so I'm going for it. Hearing your story definitely helps. I'm back into my jogging, and now that I'm posting my jogs to Facebook again, I've had people popping out of their own lives to tell me about how bad for me jogging is and how I should find another exercise that is easier on my body. In the last year, I went from feeling like I was dying in Britain from climbing the Tor to going on a hike this weekend and feeling a little winded but getting in some rock climbing, traipsing through the woods, and climbing up a hill and feeling rather accomplished while doing it. I'm nowhere near a thirteen, or even five, mile run, but at the same time this jogging thing has helped build my confidence in my own body, helped me fit up to the point where I feel like I can really participate in physical fun, and face life's challenges even if they're an inconvenience. Thank you for posting to your "Not a Fitness Blog" so people like me can see what can be done by one of our nerdy peers and be persuaded that, if we work at our own pace and figure out what's right for our bodies, we can start moving mountains a little at a time and despite what people who mean well tell us.